For more information or to contribute directly, contact the State Director. It seems that a new report is released daily concluding that science education must be improved in schools. Business leaders bemoan that fact that the organization of science curriculum and instruction does not provide the kind of support for science learning that results in deep understanding of scientific ideas and an ability to engage in the practices of science. 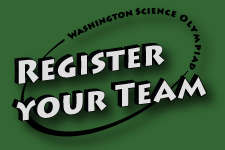 We believe Washington Science Olympiad (WSO) engages students and changes their perceptions of science and scientists. Further, we believe that WSO encourages students to become self-regulated learners and offers them opportunities to dive deep into the areas of science that they are most interested in. Too many students in Washington State are suffering through boring, lecture-based, paper-pencil assessed curriculum that is turning students off to science. WSO wants to bring the Olympiad to every school and every student. We want to develop meaningful curriculum for our teachers and recognize academic achievement! Would you help us? Would you help us reduce the registration fees that cause many schools not to participate? 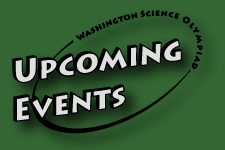 Will you help us develop curriculum that supports our events? Will you help us establish scholarships for our students? Will you help us offer more summer camps for students and coaches workshops for teachers? If you will, then please donate today. 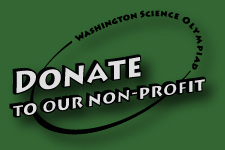 We are a non-profit organization that can provide charitable donation forms so that donations will be tax deductible. Once your donation is recieved a statement will be mailed to you officially recognizing your contribution for tax purposes. We will recognize you on our website as well (optional). No gift is too small!